This past weekend I sat on a business panel in front of a couple hundred freelancers, solopreneurs and digital agencies. At one point a person asked about how to handle the challenge where growth was happening in one part of the organization but wasn’t getting matched elsewhere in the organization. Success is a function of healthy communication, strategic thinking and employee alignment. And those are great things. If you don’t do those things, you should. But their correlation to success is suspect. After all, don’t you know people or companies that are successful even if they don’t know how to spell “strategy”? I do. Don’t you know companies that communicate poorly – and yet they still get hired? I do. What about companies with horrible customer service – don’t you still find that they’re not going out of business as much as you wish they would (side eye at cable companies)? I do. Success comes from great communication, great thinking, and great alignment. But companies with poor communication, poor thinking and poor alignment also succeed. There is no company in the world where everything is growing at the same rate. Your world is chaos. You just have to figure out how to live in the midst of it. It’s not just you. Every business is in chaos, just different kinds. Anyone who tells you otherwise is lying to you. If you’re thinking that other people have figured it out while you’re the only one in chaos, that’s where your thinking has gone sideways. Everyone is struggling. Everyone wishes and hopes for better communication, better alignment, and better strategic thinking. But we’re all just jumping reactively from one thing to another. There is no escaping the chaos. So how can we make the best of the chaos that we’re all experiencing? This is where a few leadership mantras can help us. 1. Manage people like the adults they are. A lot of time we react to chaos with an attempt to tighten up control. Unfortunately, this doesn’t work for your best employees. They’re smart, skilled, and capable. When we control them, we treat them more like children than adults. So give them space and the ability to make their own decisions. Treat them like the adults they are. 2. Mistakes will be made. Leverage them. In the midst of the chaos, people will make decisions that aren’t the right ones. They’ll put too much weight on the wrong factor, get distracted by something, or spend their time on an initiative that isn’t the most important. Instead of trying to eliminate mistakes, learn to leverage them as ways to educate your team. One of the things I see a lot when we’re in the middle of chaos is that it’s easy to get anchored with false narratives. We have to pick from choice A or B (and each has their own downsides). In the stress of the moment, it’s easy to get tunnel vision and restrict our thinking. Don’t let that happen. Learn to generate more options (C, D and E). The other dynamic when people feel the stress of chaos is that they just stop making decisions. Our goal has to be to help them make their best call, without the fear that a mistake will be (professionally) fatal. Once you help people embrace the chaos, you’ll notice something. They’re less stressed. I reminded the audience that for a period of ten years I led startups where we never had a runway longer than about 3 months. The first year I was constantly sick to my stomach. By the tenth year, I didn’t even notice it. It’s amazing what we can get used to as our “normal.” While that can be scary, it can also be great. If you learn to live and manage inside the chaotic whirlwind of running a business, you’ll find success – even if you’re not the best communicator, best strategic thinker or best manager in the world. 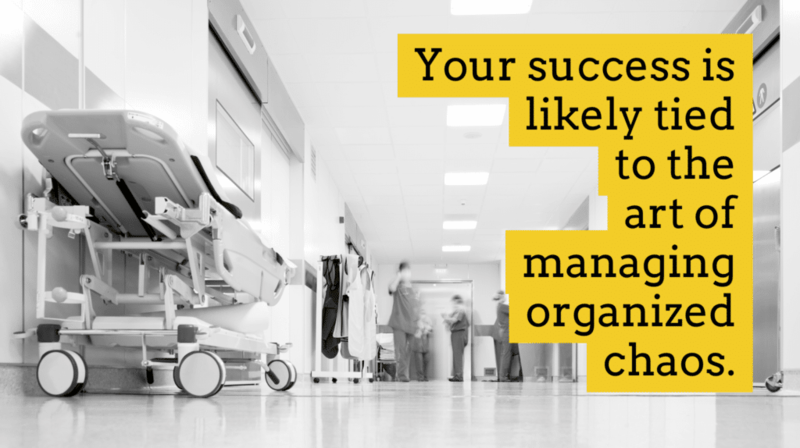 Think about it this way, if people couldn’t learn the art of managing organized chaos, would you ever trust going to an ER? It’s a prime example of a context where they embrace the chaos and still do incredible work (saving lives).